Dana H. had a bit of a scare in the loft of an old carriage house on a gloomy day, a property she and her husband were thinking of buying. The sun breaking through a window cast a shadow of a large man standing behind her. Spinning about, it turned out to be the last man to be afraid of: Santa Claus. 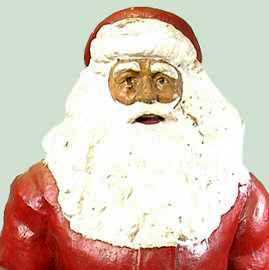 “I bought this large Santa figure from a property my husband and I were looking at. I was looking around the loft of the carriage house, which wasn’t very well lit until the sun came out. The Santa was by the window and all I could see is this shadow of a man standing behind me. It scared me half to death. 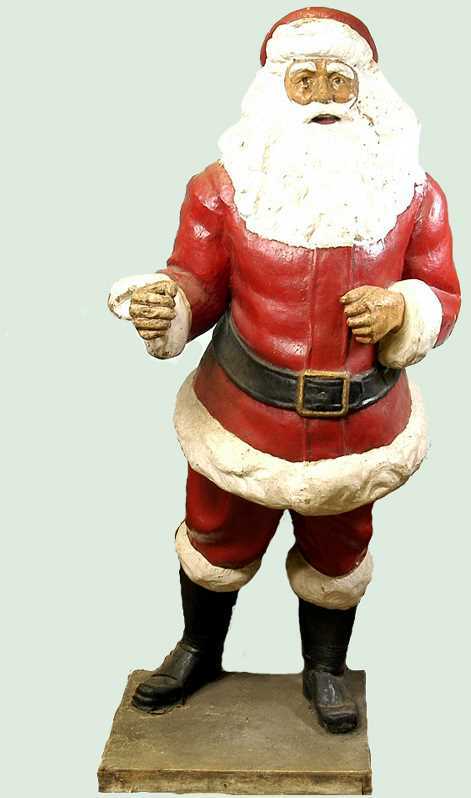 This 5-foot-tall Santa was found in an attic and purchased for $300. It was no lump of coal for the buyers. With a story like that, I’d find it hard to sell Santa. What a great tale to pass along to the kids in the future. Based on your images and the information from the owner, this large Santa was most likely a toy-store prop or was part of a department store Santa photo booth from the 1940s. Santa likely was discarded when his arm was broken or a newer display replaced him. Most display pieces like this are molded out of some sort of composite material or papier-mâché, often hollow to keep the weight down. Later examples are made from plastic or fiberglass. Without a label or name tag, it’s impossible to determine a maker, but Santas of this size and vintage ?are relatively rare, whether they are marked or not. In the current market a comparable one at auction would sell ?in the $1,500-to-$2,000 range.